A screen grab a video of the ULFA (I) cadres at an undisclosed location. A month after Assam police lost an officer, Bhaskar Kalita, a video of ULFA (I) cadres has emerged in which they talk about a police “informer” who double-crossed the police regarding the information of ULFA (I) presence at Kujupathar under Bordumsa police station in Upper Assam’s Tinsukia district, The Telegraph reported. 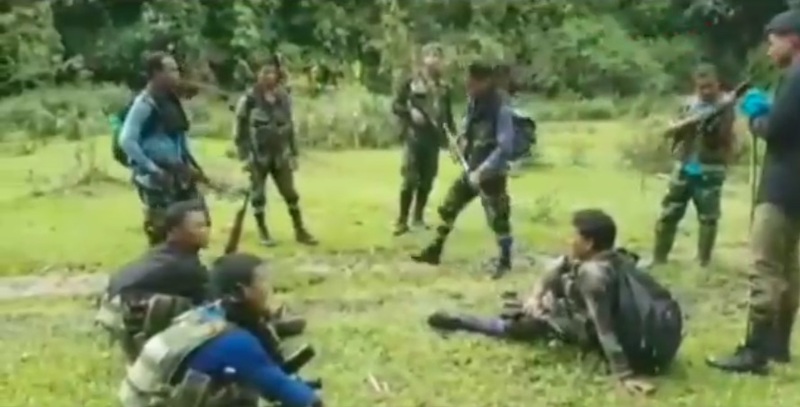 The video, uploaded by ULFA (I) on their Facebook page, ULFA Swadhin, shows nine cadres, most of them armed. The cadres include Gyan Asom, Tiger Asom, Jaan Asom, Uday Asom, Bibek Asom (the one who fired from the weapon of Bhaskar), Rupam Asom, Yangkhu and two unidentified ones. “The video is related to the killing of Bhaskar Kalita. Five out of the nine cadres, Tiger, Yankho, Rupam, Jaan and Gyan, were involved in the encounter while Uday, Bibek and two other cadres, not part of the strike team, received them at Papung on the way back to Arakan camp in Myanmar,” the newspaper quoted a source as saying. In the 1.23-minute clip, Gyan is seen saying Assam police made a “fool” of themselves and one cadre asks how. “The informer was our man, he informed us and saved us and not them……. and we profited,” another cadre is seen as responding. ULFA (I) cadre Bibek is seen firing a shot from the weapon, suspected to be that of the slain police officer. Though the audio of the video clip is not very clear, at one point of time one of the cadre can be heard saying, “Etiarpora Assam police khedile maribo lagiobo kintu, sabole nai.” (From now onwards we have to attack Assam police if they attack us, nothing to see). “We were not attacking them, but were taking shelter. They (Assam police) attacked us,” the cadre went on to say. Bhaskar, 34, the officer-in-charge of Bordumsa police station, was killed in an encounter with ULFA (I) in the first week of May this year at Kujupathar under Bordumsa police station in Tinsukia district. He was the officer leading the team that reached first following a tip-off from an informer about ULFA (I) cadres hiding in the house of one Ranjan Bora at Kujupathar.